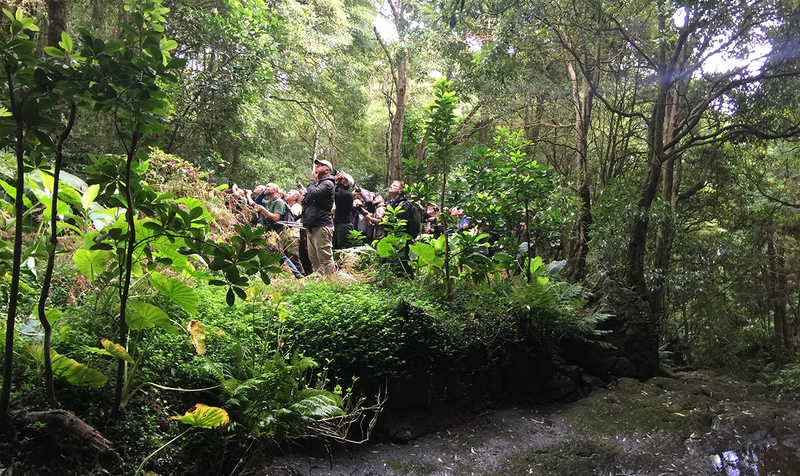 Ever since Peter Alfrey's now-famous expedition in 2005, Corvo – one of the two westernmost isles of the Azores archipelago – has gained an amazing reputation in a Western Palearctic (WP) context. Thanks to 13 years of birding coverage, a pattern has progressively emerged: Nearctic rarities can be invariably expected there each autumn. The island's list of recorded New World species continues to grow year on year, and by early November 2017 had reached 105. 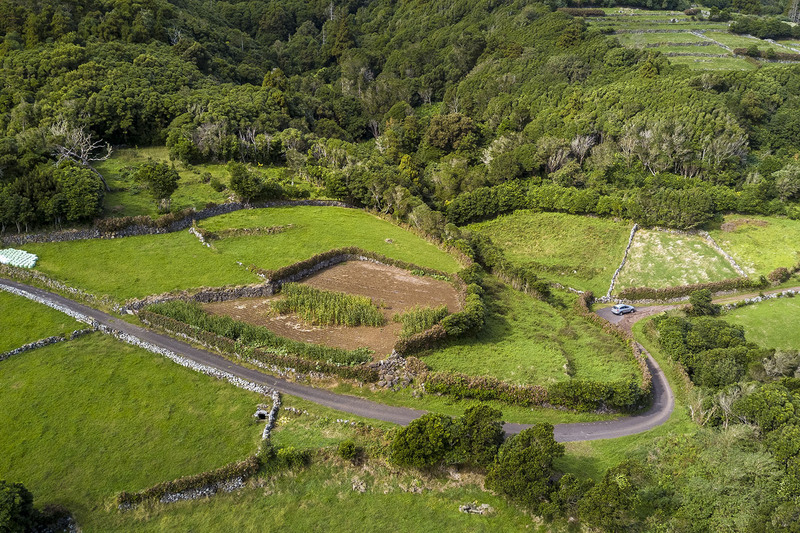 The eastern side of Corvo is dominated by pasture fields, stone walls, hydrangea hedges and densely vegetated valleys. In the image above, captured by drone, the lower part of Fojo wood is depicted – note the car on the right for scale (Vincent Legrand). While perseverance pays off in the long term, each of these autumns have been strikingly different to the others in terms of both the numbers and quality of species produced, making the potential rewards for an irregular or first-time visitor unpredictable. Some years produce next to nothing, although others are particularly bountiful. The latter are characterised by sustained Nearctic arrivals on the island throughout October, with massive landfalls on particular days, often – but not systematically – explained by an above-average cyclonic activity in the North Atlantic Ocean on the preceding days. Three such years fall under the 'big year' definition: 2012, 2015 and 2017. The latter probably deserves a category on its own: it proved a truly 'mega' year, as the following summary demonstrates. But what made 2017 another bonanza year for the 80 or so birders who visited Corvo in September and October? To answer this question, it's worth looking at the length of the hurricane season (1 June – 30 November) on the Eastern Seaboard of the United States. According to the National Oceanic and Atmospheric Administration (NOAA), autumn 2017 produced 17 'named' storms, of which 10 became hurricanes including six major hurricanes (Category 3, 4 or 5), among which were the first two major hurricanes to hit continental USA in 12 years. Based on the Accumulated Cyclone Energy index, which measures the combined intensity and duration of the storms during the season and is used to classify the strength of the entire hurricane season, 2017 was the seventh most active year in the historical record dating to 1851 and was the most active season since 2005. Chronologically, September was a devastating month for the eastern USA and the Caribbean with Irma hitting the Caribbean and south-eastern USA in early September, followed by Maria in the Caribbean and Puerto Rico in late September. It is most likely the latter along with its associated cast of depressions which explains the extremely impressive tally of vagrants logged by just four birders during an early-season visit to Corvo between 23 September and 2 October. That period produced no fewer than 30 individual Nearctic landbirds, including four species recorded fewer than 10 times in the region: a Magnolia Warbler on 23rd (the seventh for the WP), Black-throated Green Warbler from 27-30th (eighth record), Canada Warbler on 28th (fifth record) and a stunning male Black-throated Blue Warbler on 1st (ninth record). Other noteworthy landbird records made by this small but efficient team included an astounding 16 Red-eyed Vireos, four Black-and-white Warblers from 23-26th, two Rough-legged Hawks from 26-29th, one each of Philadelphia Vireo, Ovenbird and Common Yellowthroat on 27th, a Rose-breasted Grosbeak on 29th and two Northern Waterthrushes on 2nd! October arrived and so did many more birders, all with high hopes that the feast would continue for the rest of the season. However, despite daily island coverage, the remainder of the first week of October (3-8th) was rather quiet, a situation presumably explained by the anti-cyclonic conditions prevailing in the North Atlantic. Just a few additional discoveries were made, these including a male Belted Kingfisher (the first for Corvo), the third and fourth Northern Waterthrushes of the season on 3rd and 6th, a single Bobolink on 6th, the second Philadelphia Vireo of the autumn on 7th and both Scarlet Tanager and the autumn's second Ovenbird on 8th. Increasing numbers of birders had arrived on the island by the first week of October. This image, taken on 19 October, conveys a typical Corvo twitch (Mika Bruun). During the second week of October (9-15th) birders continued to arrive, with up to 40 present. Despite the high pressure and east winds resuming in the first part of the week, further new findings included both a Yellow-billed Cuckoo and the second Rose-breasted Grosbeak for the season on the 9th and an American Buff-bellied Pipit on 10th. Change came on 13th: the clear skies and temperatures approaching 30°C that had been dominating weather across the Azores archipelago were quickly replaced by heavy rain and a south-west breeze. Conditions further deteriorated as Hurricane Ophelia moved past Corvo over the weekend of 14-15th. As the easternmost major hurricane in the North Atlantic since 1980, Ophelia wasn't expected to deliver Nearctic vagrants as it moved up from West Africa. However, the weather system dragged across a strong westerly airflow from North America, and with it came the megas. Both Saturday 14th and Sunday 15th were days for the history books, as 2017's second Black-throated Green Warbler was found on 14th and both Blackburnian Warbler and Yellow-throated Vireo on 15th (the fifth and seventh WP records respectively). 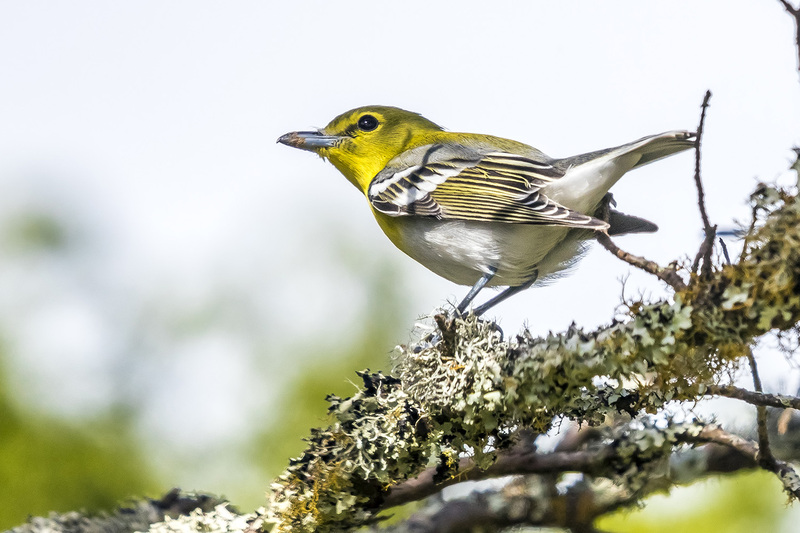 The supporting cast of Nearctic landbirds recorded over that same weekend included three Blackpoll Warblers (one on 13th and two on 14th), two Red-eyed Vireos and the season's second records of Common Yellowthroat and Scarlet Tanager on 14th. Blackburnian Warbler, 'Tennessee Valley', Corvo, Azores, 15 October 2017 (Vincent Legrand). Yellow-throated Vireo, 'Tennessee Valley', Corvo, Azores, 15 October 2017 (Vincent Legrand). The third week of October (16-22th) saw the westerly airflow strengthen to the point that it severely impeded checking all but the most sheltered parts of the island until 18th. 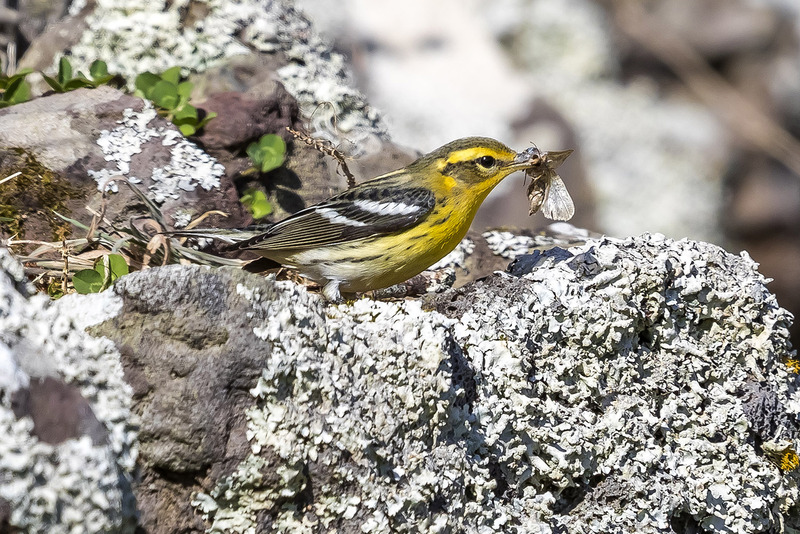 Therefore, despite the record number of birders present on the island (70 individuals), just two Red-eyed Vireos on 16th and an elusive Dickcissel (sixth for WP) on 18th were the sole new discoveries in the first half of the week. At that time, Hurricane Ophelia had already left the Azores and could not be the explanation for the extremely windy conditions encountered on Corvo. Looking back at meteorological data, it becomes apparent that another rather uncommon phenomenon was actually at work, namely the convergence of the polar and subtropical jet streams along the eastern US seaboard, which occurred on 17th and resulted in sustained winds blowing eastwards across the Atlantic Ocean on 17-19th (see Fig 1). Such promising conditions started to pay off on 19th with the discovery of the autumn's third Black-throated Green Warbler, second Magnolia Warbler, third Ovenbird and second Yellow-billed Cuckoo. Magnolia Warbler, Ribeira da Ponte, Corvo, Azores, 19 October 2017 (Vincent Legrand). Then, on 20th, came one of those 'golden days' that makes Corvo such an unrivalled vagrant-hunting destination in the region. The strong westerlies that had been continuously blowing during the previous seven days finally died down, allowing for thorough investigation of the island with mind-blowing results. 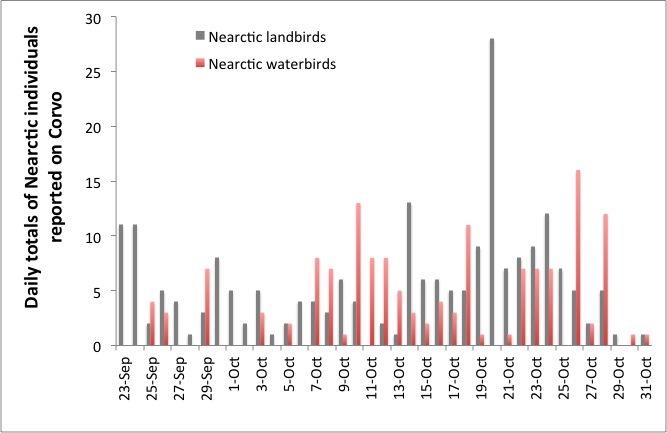 No fewer than 28 individual Nearctic landbirds were reported during the day, of which 15 were new arrivals (see Fig 2). By mid-morning, three Common Yellowthroats, a Black-and-white Warbler, an Ovenbird, a Black-throated Green Warbler, an Indigo Bunting and a stunning Hooded Warbler (the fifth for WP) had been logged. 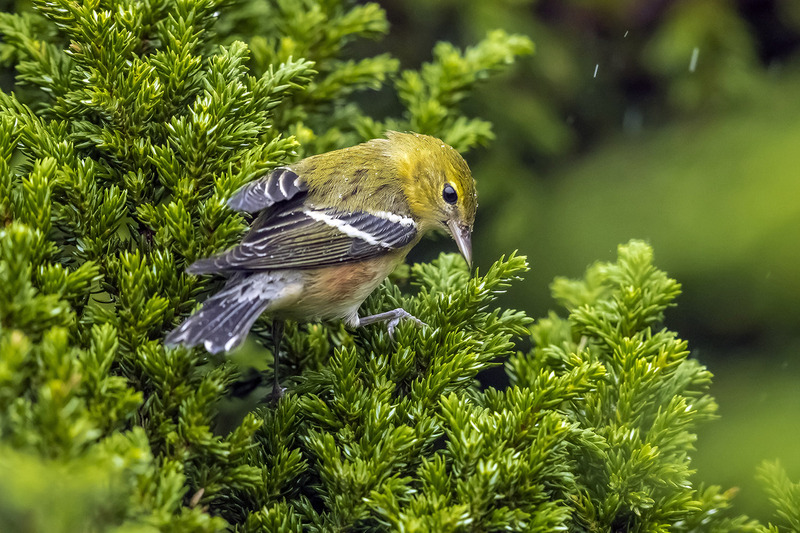 The madness continued into the afternoon, with up to eight Red-eyed Vireos reported from the valleys, as well as four Yellow-billed Cuckoos, a Grey-cheeked Thrush, Tennessee Warbler, Scarlet Tanager, Dickcissel, Rose-breasted Grosbeak and three Blackpoll Warblers. It was a day that those on the island will never forget, even those who'd been present for the previous big fall (on 17 October 2015). 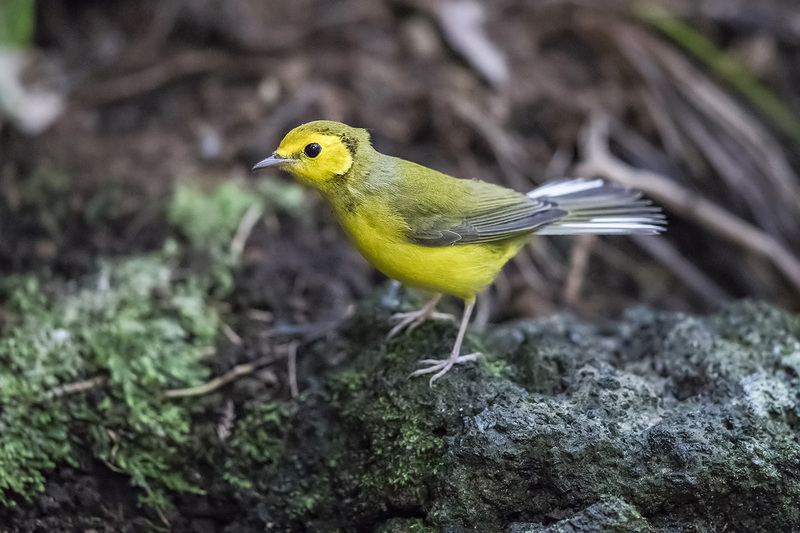 Hooded Warbler, Ribeira Cancelas, Corvo, Azores, 21 October 2017 (Vincent Legrand). 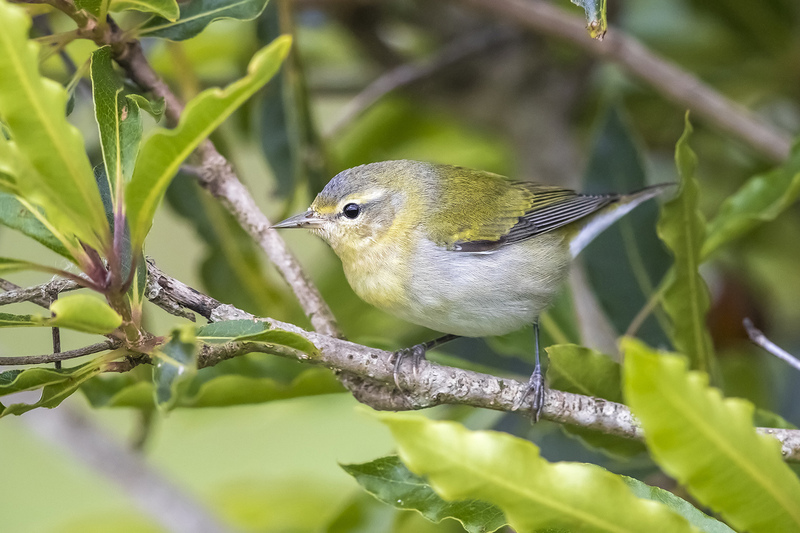 Tennessee Warbler, Corvo, Azores, 21 October 2017 (Vincent Legrand). 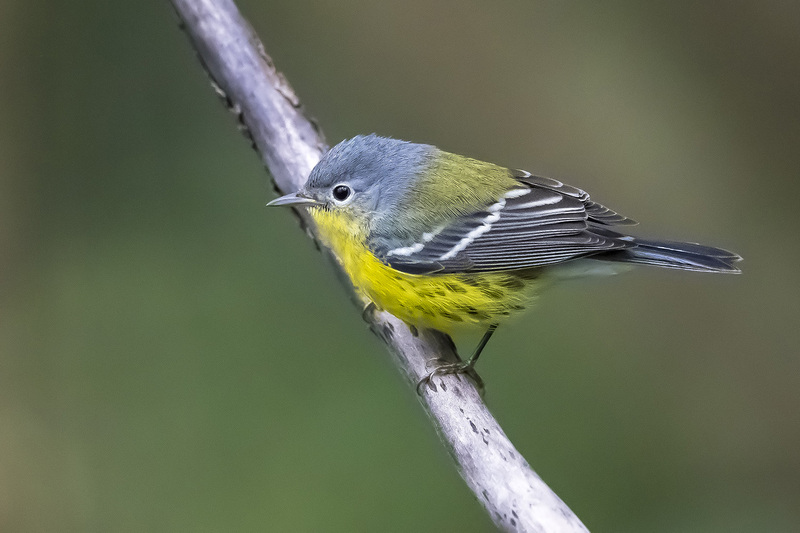 During the weekend (21-22nd), new additions included four new Blackpoll Warblers – making a total of eight for the season – as well as the autumn's sixth Northern Waterthrush, fourth Ovenbird and second Indigo Bunting. New for the year was a Swainson's Thrush but, more significantly, the autumn's highlight – a Bay-breasted Warbler on 22nd. This constituted just the second WP record, following the record of a bird at Land's End, Cornwall, in October 1995. Bay-breasted Warbler, Lighthouse Valley, Corvo, Azores, 22 October 2017 (Vincent Legrand). Perhaps owing to a large-scale departure of birders after 22nd, the final full week of October (23-29th) produced much lower numbers of Nearctic stragglers. However, a few new records were still of utmost quality: the second Hooded Warbler of the autumn, this time a stunning male, was found on 23rd, along with a third Philadelphia Vireo and a Cedar Waxwing. These were followed by the second and third Grey-cheeked Thrushes, fifth Ovenbird and fourth Scarlet Tanager of the autumn on 24th and, to close the landbird haul for 2017, an American Robin, another Indigo Bunting and the autumn's fourth Rose-breasted Grosbeak all discovered on 26th. The summary would not be complete without mentioning that 19 non-landbird species were observed on the island throughout the autumn, the most noteworthy records of which being two Surf Scoter on 16th and 23rd and a Bonaparte's Gull on 31st, both species being new to the Corvo list. With the last birder leaving on 4 November, an unprecedented period in the ornithological history of the Western Palearctic came to a conclusion. During a 48-day period, 155 individuals of 48 Nearctic species were recorded on the 3.75 square-mile island of Corvo, including an exceptional 97 individuals of 29 landbird species (see Fig 3). On average, this means that one new species and over three new individuals were recorded on the island daily. In a single autumn, Corvo alone has thus produced more Nearctic landbird species than, and about two-thirds of the total of, all the accepted autumn records of Nearctic landbirds in Britain and Ireland over the 10-year period from 1997-2006 (see e.g. Elkins 2008, British Birds 101, Table 2 p460). For more details on Corvo birding in autumn, including updates from previous years, please visit birdingcorvo2013.blogspot.com. Fig 1: Charts illustrating the North Atlantic jet stream from 17-19th October, shortly before the record 'fall-out' on 20 October 2017. Particularly apparent is the convergence of both polar and sub-tropical jet streams along the eastern seaboard of the USA on 17th, resulting in strong westerly winds blowing across the Atlantic Ocean on 18-19th and reaching the Azores archipelago. Fig 2: Daily totals of individual Nearctic birds, including both new discoveries and relocated birds, observed throughout autumn 2017 on Corvo, Azores. 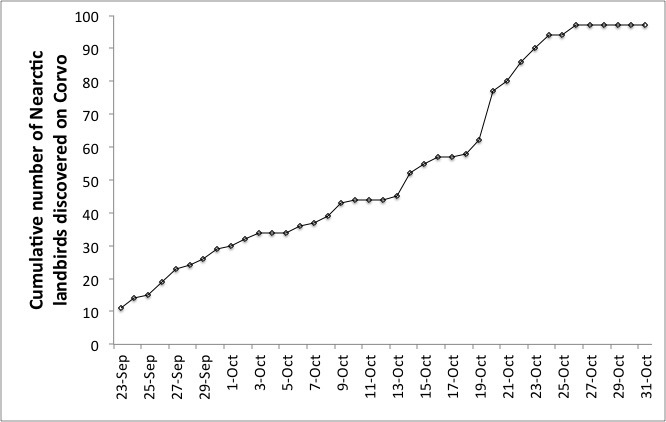 Fig 3: Cumulative plot showing the total new Nearctic landbird individuals discovered throughout autumn 2017, Corvo, Azores.